a) I gave up - because it's Fall/Winter soon and you do not need abs for winter. c) I went on two holidays since then - and when you're on holiday, you just don't say no to the temptations. However, after coming back from holiday having consumed all that glorious food, I felt so bloated and was in need of a quick fix (when I say fix, I mean detox). 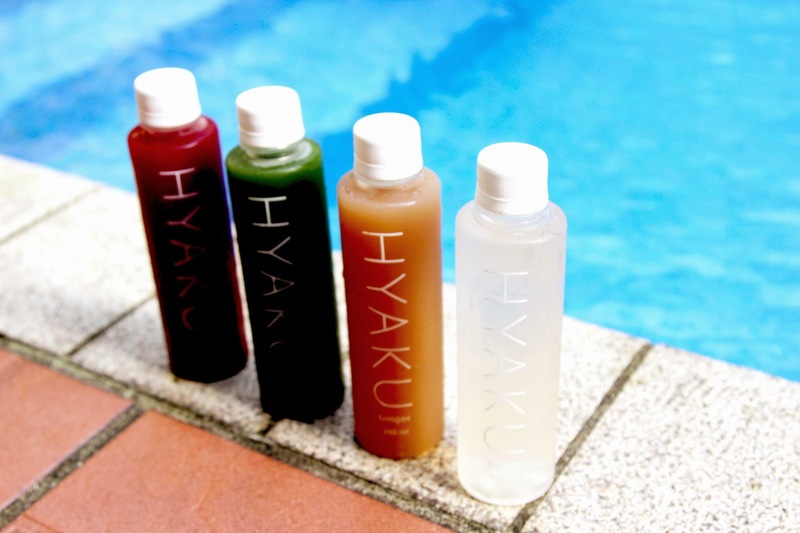 Until Hyaku got in touch with me and delivered their 5-day taster plan to me every single days for 5 days. This was a very pleasant juice cleanse where you do not have to drink nothing but juices for 5 days straight without having any food in your stomach. I love how Hyaku doesn't work like that, and how the juices are supposed to complement your diet, instead of a replacement. I usually would pair my Crimson juice with a cup of yoghurt and granola to obtain more grains into my system. As a child, I absolutely hated greens. And ginger. Ask anyone who knows me and they will tell you that veggies are not my thing. I was pleasantly surprised that all the juices were absolutely delicious, and after finishing one bottle I would crave the next. If you get tired of the same taste easily (like I do), worry not, as each day you will get a different fruit - different taste. I also love how the quantity of the juice doesn't completely fill you up with the result of a stomach full of liquid. It is just the right amount, leaving space for food that is also essential to your diet. What's more, Hyaku is all about being environmentally-friendly. 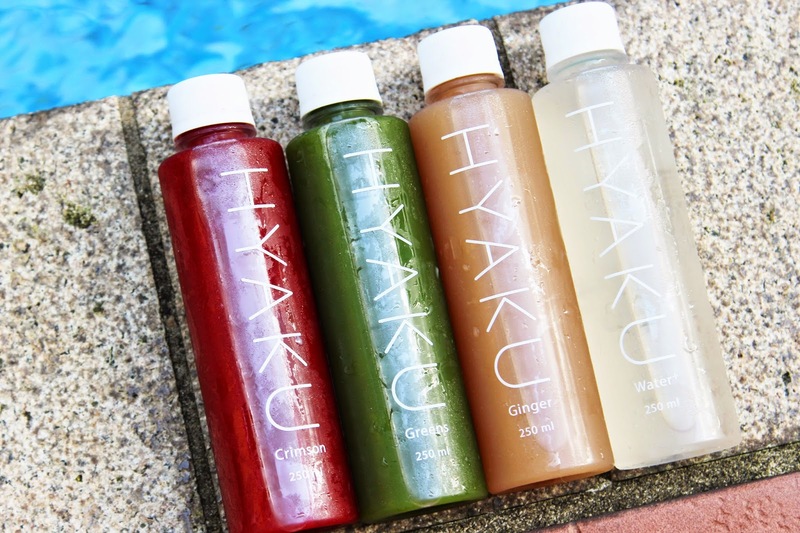 Once you're done with your juices, you can either reuse them as water bottles, or have them collect your Hyaku box and bottles on your Friday delivery! The result? Well to say it subtly, lets just say that you definitely feel the 'detox'. I did not look into how much weight I lost during the 5 days as ultimately, that was not my goal. Instead of lugging myself around the house, I actually felt more energized since starting the plan. I would never say no to healthy juices delivered to my doorstep every single day. This is my answer to a healthy diet simply because it takes care of my required daily intake of fruits and vegetables (which I was naturally bad at beforehand). Moreover, the juices do not contain added sugars (yet the juices taste pleasantly sweet) nor preservatives, plus are non-pasteurized. From my personal juicing experience with Hyaku plus their corporate social responsibility that they take seriously in protecting the environment and helping others, I can definitely say that they get a big thumbs up from me. Have any of you tried a juice cleanse? Yay or nay? Let me know your thoughts in the comments! Disclaimer: The juices were sent to me by Hyaku. This post is not sponsored.